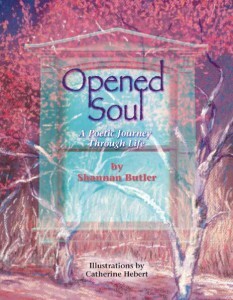 2DonnBooks is proud to announce the release of Opened Soul, the first published collection from local writer Shannan Butler, illustrated by Catherine Hébert. Shannan discovered her love for writing at the age of twelve. Since that time she has written many short stories, poems and other literary pieces. Many of her specially composed writings have been used during Black History Month, church and holiday programs, weddings, youth banquets, and online magazines. She regularly contributes poems to her monthly church newsletter. Opened Soul is her first collection of poems published in book format, and reflects the people, places and things that have impacted her life thus far. From the vibrant life of her community to the deep spiritual guidance of her faith, Opened Soul is a poetic journey through a life richly embraced. Before pursuing a writing career Shannan majored in Early Childhood Education at Shaw University, and Social Work at Radford University. For the past twelve years Shannan has worked as a preschool teacher, where she has been able to use her creative writing skills to invent whimsical stories for children. Shannan currently lives in Centreville, VA, with her 6-year-old son. Catherine Hébert has been in the advertising and publishing field for over 25 years, having enjoyed a variety of projects ranging form highly commercial to pleasantly artistic. Evolution in the industry from time consuming “cut-and-paste” techniques to sophisticated computer graphics has made illustration a wild and creative venture for her. Catherine lives in the Rocky Mountains of Vail, Colorado with her husband, Tim and teenage daughter, Sunita.